EN GARDE! A FAPA PUBLICATION WHOLE NUMBER XIV. Compounded In Convulsive Confusion By AL (whole member) ASHLEY of 25 Poplar, Battle Creek, Michigan. July, 1945, MAILING. "The Publication of Placid Parts" YE TROVE INSYDE TO KEEP THE RECORD STRAIGHT you are sill on Page 1. 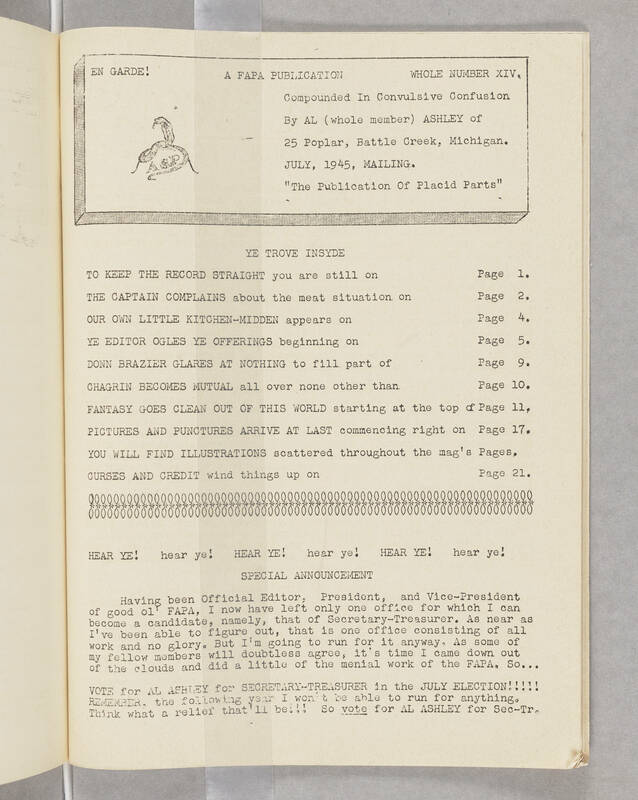 THE CAPTAIN COMPLAINS about the meat situation on Page 2. OUR OWN LITTLE KITCHEN-MIDDEN appears on Page 4. YE EDITOR OGLES YE OFFERINGS beginning on Page 5. DONN BRAZIER GLARES AT NOTHING to fill part of Page 9. CHARGIN BECOMES MUTUAL all over none other than Page 10. FANTASY GOES CLEAN OUT OF THIS WORLD starting at the top of Page 11. PICTURES AND PUNCTURES ARRIVE AT LAST commencing right on Page 17. YOU WILL FIND ILLUSTRATIONS scattered throughout the mag's Pages. CURSES AND CREDIT wind things up on Page 21. HEAR YE! hear ye! HEAR YE! hear ye! HEAR YE! hear ye! SPECIAL ANNOUNCEMENT Having been Official Editor, President, and Vice-President of good ol' FAPA, I now have left only one office for which I can become a candidate, namely, that of Secretary-Treasurer. As near as I've been able to figure out, that is one office consisting of all work and no glory. But I'm going to run for it anyway. As some of my fellow members will doubtless agree, it's time I came down out of the clouds and did a little of the menial work of the FAPA. So... VOTE for AL ASHLEY for SECRETARY-TREASURER in the JULY ELECTION!!!!! REMEMBER, the following year I won't be able to run for anything. Think what a relief that'll be!!! So vote for AL ASHLEY for Sec-Tr.